U.S. stocks were little changed Monday as investors found little in the latest batch of earnings reports to justify the market's recent rise to an all-time high. Still, the Standard & Poor's 500 index did manage to hit another record high. 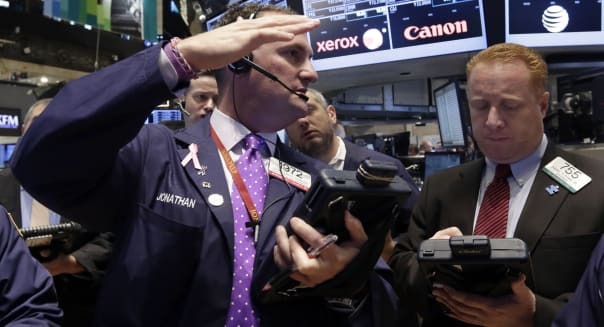 The Dow Jones industrial average (^DJI) lost 7 points, or 0.1 percent, to 15,392, the Nasdaq composite index (^IXIC) rose 6 points, 0.2 percent, to 3,920, and the Standard & Poor's 500 index (^GPSC) edged up a fraction of a point, closing at 1,744.66 -- which was still enough to beat its previous high-water mark, set on Friday. McDonald's (MCD) fell 60 cents, or 0.6 percent, to $94.60 after the world's biggest hamburger chain reported quarterly revenue that fell short of analyst expectations. The Oak Brook, Ill.-based company also warned that global sales at established restaurants would be relatively flat in October and signaled that weakness would continue in the fourth quarter amid stiff competition and a halting economic recovery. McDonald's, which has roughly seven times the sales of Wendy's (WEN) and Burger King Worldwide (BKW) combined, has been slower than its rivals in adapting to changing consumer demands. In commodities trading, the price of oil dropped below $100 for the first time since early July after a government report showed that U.S. supplies continue to rise. Benchmark crude for November delivery ended the day at $99.17, down $1.64 for the day. Gold rose $1.30, or 0.1 percent, to $1,315.70 an ounce. JPMorgan Chase (JPM) reached a tentative $13 billion deal with the U.S. government to settle investigations into bad mortgage loans sold to investors by JPMorgan and the banks it bought during the financial crisis. Shares were down 3 cents at $54.27. Hasbro (HAS) surged after reporting that its net income rose 17 percent as sales increased. Its adjusted results and revenue topped analysts' estimates. The stock climbed $2.48, or 5.3 percent, to $49.72. Halliburton (HAL) fell $1.81, or 3.5 percent to $50.66, after third quarter revenue fell below analyst expectations. The energy-services company reported third-quarter net income rose by 17 percent on strong revenue from its international operations, which offset sluggish growth in North America. Goodyear Tire & Rubber (GT) slipped 6.7 percent to $21.12 after Deutsche Bank (DB) downgraded its rating on Goodyear to "Hold" from "Buy" and lowered its target price on the stock to $26 from $29 based on concerns about margins over the next few years. Tellabs (TLAB) rose 4.7 percent to $2.46 after the communications equipment maker agreed to be acquired for $891 million by investment firm Marlin Equity Partners. VF Corp. (VFC) rose 3.4 percent to $211.25 after its earnings beat analyst expectations. Gannett (GCI), the media company that owns USA Today, fell 2.2 percent to $26.90 after the company reported lower earnings and revenue for the third quarter. Osiris Therapeutics (OSIR) plunged 17 percent to $14.51 after the company said the Food and Drug Administration will treat its wound-care product Grafix as a drug. Osiris had maintained that it didn't need FDA approval for its products because they are derived from human cells. Dean Foods (DF) rose 0.8 percent to $18.42 after a BMO Capital Markets analyst raised his rating on the stock to "Outperform" from "Market Perform" and boosted his target price for the dairy company's shares to $23 from $22.